Scary Mom Experience – Our Run-In With Reactive Airway Disease ﻿ – Abbey Co.
Every mommy, at some point I am sure will have a completely terrifying moment as a parent. For some, it could be your kid having a bad fall and breaking a bone. For others it might be an instance, where maybe your kid ran away in public and you couldn’t find them. For me, reactive airways disease created my scary moment. It is basically what they diagnose your child with when they are having breathing problems, and the child is too young to diagnose with a chronic illness such as asthma. Our daughter had a few run-ins with scary breathing episodes as a very little baby. 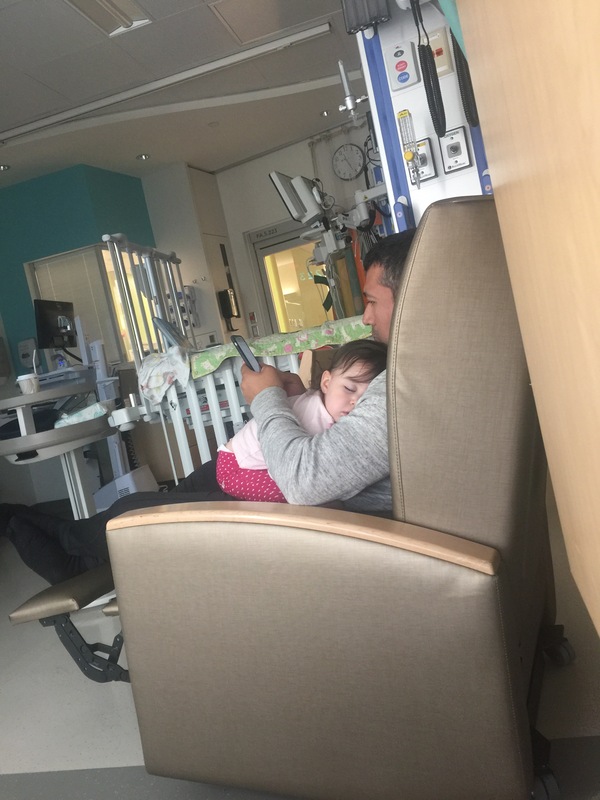 Around perhaps 8 months old she got a terrible cold that left her wheezing and gasping for air, and the doctor diagnosed her with “Croup” (a children’s respiratory disease that results in a terrible sounding cough). Perhaps about 4 months later, we went through this again… even though she struggled to breathe, our alarms didn’t go off since it sounded exactly the same as last time. She sounded terrible, but brushed it off and got over the illness on her own just as she did the last time. Fast forward to when our daughter was about 18 months, and this terrible wheezy breathing and cough comes up, YET AGAIN. She had a cold, and this wheezy breathing (sounding terrible but also like the times before) was back. For me, it was one of those moments as a parent where you don’t know what the heck is going on or what you should do. Since it sounded the same as what we had encountered and gotten over without any treatment, my husband and I packed her up and off to the nanny’s house just as we had before, and proceeded with our days at work as usual hoping she would be feeling better soon. Within a few hours our nanny called to say something was not right… her breathing was getting much worse quickly. It was not the same this time after all. My husband rushed to pick her up and brought her to her primary care doctor. Her pediatrician gave her a few rounds of nebulizer, and said if her breathing did not get better we should go in to Seattle Children’s Hospital. She left the pediatrician’s, and still proceeded to get worse. Off to Children’s they went. I left work to meet up with them, and by the time I got there couldn’t believe the sound of her struggling. They hit her with another round of steroids and in the hospital setting she began to panic and threw a fit, which of course made her breathing exponentially worse. They decided to admit her, and on admission she registered an 8 OUT OF 10 on their scale determining severity of respiratory distress. So yeah, 10 would basically be NOT BREATHING. Holy Crap. We ended up with a full 24-hour stay, while they gave her rounds of nebulizer, suctioned off all the mucus from her cold, and monitored her breathing every few hours. The one thing that amazed me was that at the end of our stay, 6 doctors along with the group of nurses that had been caring for her entered the room for a care conference with us. They admitted that due to her age, there is no way to know if this was just a terrible virus, or if she is developing asthma and will have a chronic issue with it. They ASKED US what we felt comfortable with in regards to treatment. They involved us in the decision to discharge her, in addition to the decision how to treat her continuously, since we are her parents and know her best. WOW. Just, wow. Never have I had an experience in healthcare like this, where we were so involved, and our opinions as parents so valued. For years before even having a child, I have heard families rave about the care they received at Children’s Hospital Seattle, and now I know why. What a blessing it is to have such a resource in this area, where we could enter in a state of emergency, and leave the next day exponentially better. To have access to a care platform where they ASK the parents what they think about the treatment plan. They truly are amazing. If your child has troubles with breathing problems and reactive airway disease very young, I am here for you and know how scary it is. Do rely on your local children’s hospital for help. Don’t head to the walk-in clinic or ER. Children’s Hospital IS IT. Reactive airway disease is relative to small children, and a Children’s Hospital will care for you best. Luckily, this was about 8 months ago and was our last episode of terrible breathing problems. Part of the care plan we agreed on was that they would send us home with a prescription for an inhaler that we could use next time our daughter got a cold and was sounding a little wheezy. We have used it a few times since and have so far not run into severe troubles as we had in the past. Take care all, and if you are having your first run-in with reactive airway disease, I hope you find this post helpful too! My sweet little babe in our hospital room. Breathing took all her energy, so she was napping profusely. The next morning… even though she was doing much better she still had no appetite and her cheeks were flushed pink from coughing. Ugh, this picture breaks my heart! You can look in her sweet eyes and see how wiped out she was from struggling to breathe. I’m glad to hear she’s feeling better! This is a such a terrifying situation, especially as her mom it must be heartbreaking! Sorry you had to go through that! Pingback: A Week of Giving Back, Day 1 – Seattle Area Charities – Abbey Co. Previous PostPrevious Concert Fashion Help! !